St. Francis of Assisi is the patron saint of animals and the environment. His Feast Day is October 4. Because Francis expressed his devotion to God through his love for all of God’s creation, the custom of offering blessings of animals around or on his Feast Day grew up. 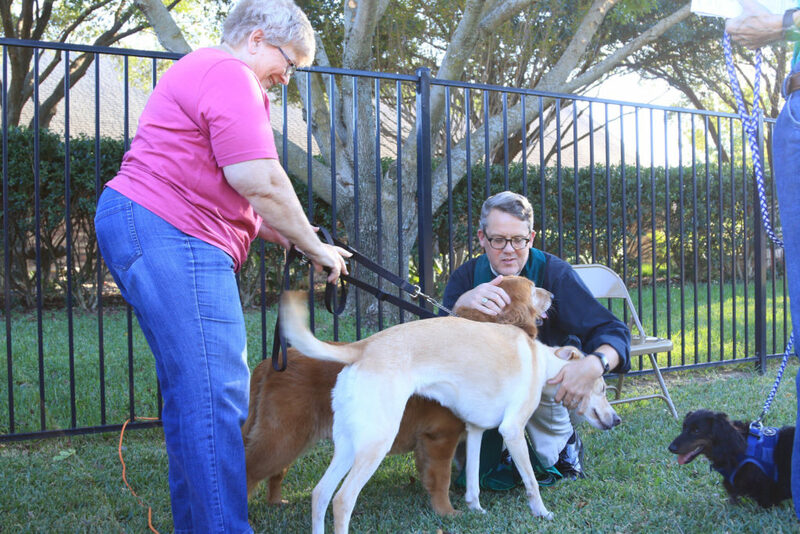 Congregations in the Episcopal Diocese of Fort Worth will be offering the Blessing of the Animals in a variety of settings including church lawns and porches, park pavilions, and parking lots on Thursday, October 4; Saturday, October 6; and Sunday, October 7. 6 pm – St. Stephen’s Episcopal Church, 463 West Harwood Road, Hurst, TX, 76054, will bless household pets in front of the church in the Gazebo at the Village Plaza shopping center. Pet food offerings are welcome for the 4Saints Episcopal Food Pantry. 6 pm – St. Luke’s Episcopal Church, 595 N. McIlhaney, Stephenville, will be offer Blessing of the Animals on the parish lawn. Treats for humans and animals will be provided. People are asked to bring a pet food donation for the Erath County Humane Society. 9 am – All Saints’ Episcopal Church, 5001 Crestline Road, Fort Worth, TX, 76107. Pet blessings will offered on the lawn. Every animal will receive an individual blessing. 10 am – The Episcopal Church of the Resurrection, 905 S. Church Street, Decatur, TX, 76234, will be blessing pets along with the First United Methodist Church of Decatur. People are asked to donate supplies for the Wise County Animal Shelter. 5 pm – St. Martin-in-the-Fields Episcopal Church, 223 S. Pearson Lane, Keller, Texas, 76248. There will be a Blessing of the Animals in which current pets are blessed and pets no longer with us are remembered. Children can have their stuffed animals blessed. The outdoor worship service will be in the north fields by the Labyrinth and Memorial Garden. 5:45 – 6:15 pm – Drive-by blessings for shyer pets in the parking lot. 4-5 pm – Trinity Episcopal Church, 3401 Bellaire Drive So., Ft. Worth, TX, 76109, will have a Blessing of the Animals on the front lawn. Bring your companion animals on a leash or in a crate for a prayer service and blessing. Each pet will receive a St. Francis medallion. 10 am – St. Alban’s Episcopal Church worshiping in Theatre Arlington will have a short worship service and Blessing of the Animals in Gene Allen Park, next door to the downtown Arlington Library. Please have animals on leashes or in crates for their safety. People are asked to donate pet food for the Arlington Animal Shelter. A professional photographer will be on hand to take photos, door prizes from PetSmart will be awarded and St. Francis medals will be given out. People can light candles in memory of beloved pets no longer with us. 3 pm – The Episcopal Church of the Good Shepherd, worshiping at the Seventh Day Adventist Church, 2016 Acton Hwy (FM 4), Granbury, 76049, will hold a Blessing of the Animals on the lawn. Each animal will receive a certificate that says, “I’ve been blessed.” People are asked to bring supplies such as pet food, cat litter, collars, harnesses, leashes, and beds to donate to the SPCA. Partially used pet medications in the original bottle will be donated to the SPCA and local vets to help reduce the cost of medical care for animals whose owners cannot pay the full cost. People also can make a cash offering, which will go to local animal shelters.